I guess it was only a matter of time until someone put little Carl (Chandler Riggs) from the Walking Dead in a movie. 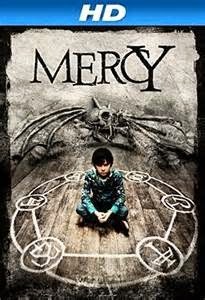 Mercy is that film, and it is based on a short story by Stephen King. There is a reason this was a short story, there wasn't enough to make an entire book out of it, so what made them thing there was enough for a full length film? Rebecca, George, & Buddy are going to spend time living with their grandmother at her cabin in the woods. She is a sick old woman and it's only a matter of time, but she isn't a candidate for the nursing home, because she is psychotic. While caring for the old woman, George (Riggs) finds some mysterious occult stuff, that lead him to believe his grandmother isn't psychotic, but possessed. This film is everything that is wrong with the Horror movies of today, because it's not scary, different, or even all that interesting, it's more stupid than anything else. For most of the movie, nothing happens, except for this kid walking around testing his theory, but what does it matter, the old woman is going to be dead soon anyway right? Chandler Riggs stars and I really don't care for him as an actor. I realize he's just a kid, but Riggs is always playing some whiny loner, looking for help. Some people might find it cute or endearing, to me it's just annoying, especially in a film where he's the lead. The rest of the cast was underutilized, especially Super 8's, Joel Courtney, who is a terrific young talent, I would have liked to see more of. Mercy is written by the master of horror and stars two of TV's top young stars, but it was a story that never developed into anything, and is buried in some massive Stephen King short story anthology. This is not the kind of story that should have ever been turned into a film. I don't say it much, but this time I really believe that Mercy was just a waste of 90 minutes that I will never get back.